Borosilicate glasses and glass products are extremely versatile and heat resistant compared to other kinds of glass. It is used for Laboratory equipment, cookware and specialised products. Boron is added to the glass mix during manufacture. Normal glass is usually made from sand (or silica), Soda (sodium carbonate) and Calcium Oxide (lime). Boron is a metalloid, or semi-metal, which means it has properties associated with metal and non-metal elements. 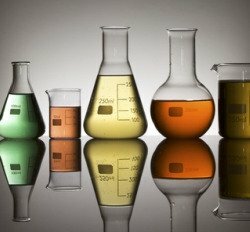 Why is Borosilicate Glass better than normal glass? It is more heat resistant than glass. This is because it has a low thermal expansion coefficient which means it is more resistant to changes in temperature. This makes it a good material to use for glass cookware and lab equipment. Although it has improved heat resistance it can still break, particularly if exposed to sudden changes in temperature. For example, immersing a hot dish from the oven directly into cold water. It will also break if dropped. We can supply a range of this glass from under 1mm thickness.